Last year when I was on my “get rid of everything we’re not using” purge after Hurricane Irma, I found my small collection of Tarot cards tucked up on a high bookshelf. I hadn’t really looked at them for years, so I was just going to donate all of it without any thought, but for some reason there were a few decks I didn’t want to donate. I still thought they were beautiful and interesting, a little collection of art, and I felt drawn to them. I didn’t know what to do with them, though. I wanted to use them, but not for divination/fortune telling because I don’t really believe in that sort of thing, not for myself at least. My personal take on that is that everything is constantly changing and being influenced by a million things which are being influenced by a million OTHER things… so divination doesn’t make sense to me, rationally, unless it takes place in an absolute vacuum, which we don’t exist in. So what to do with these cards? I did a little research online and LO AND BEHOLD, there was a whole movement of psychologists and counselors and therapists and mindfulness teachers and even a lot of Buddhists who were using Tarot cards in a sort of new way- as prompts for contemplation, meditation, well-being, and discussion. Emotional flashcards, in a way. I LOVED this idea. So much. But how were people working with some of the more arcane symbolism in the cards? The answer was simple- they were all looking at Tarot through the lens of Carl Jung’s idea of archetypes- personalities and periods of life- the same ones used throughout time in art, literature, myth, etc. In addition to the archetypes, each suit in the deck had a general meaning (swords=mind, cups=emotion/heart, wands=passion/action, coins=day to day life) and each number had a general distinction (1=potential for anything, 4 =stability, like four legs on a table, etc.). So there was a little system set up to interpret the cards and apply them to life. Beyond that, the way you used the cards was up to you. My thing is narrative resonance. I look at the card, write a little story about what’s going on in the imagery, and then I see what applies to me. 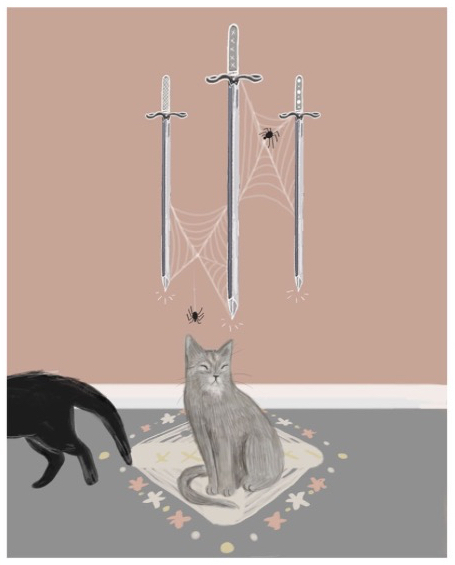 For instance, the card above from the “Considerate Cats” Tarot- I would read it like this: The Swords represent thoughts/ideas/intelligence, right? And those three Swords in the image are pinned up to the wall and cobwebby, which, to me, means they’ve been stuck up there on the wall for a long time, collecting dust and cobwebs. They haven’t been used or evolved in any way. The little kitty sitting under them has her eyes closed, sitting in her little spot, while her companion walks by. That black cat walking by represents that the world goes on while around that gray kitty, while she’s sort of sitting there, eyes closed, stuck in her own little world, stuck in those thoughts. She’s not unhappy, just not really exploring her world, seeking new things. To me, this card makes me wonder about my own thinking- what old patterns of thoughts in my mind keep me stuck? What thoughts and ideas am I clinging to? How am I not moving forward? As far as the card below, from the “Hidden Realms” deck: since the three roses represent the Swords, they symbolize ideas, thoughts, and maybe even wishes. 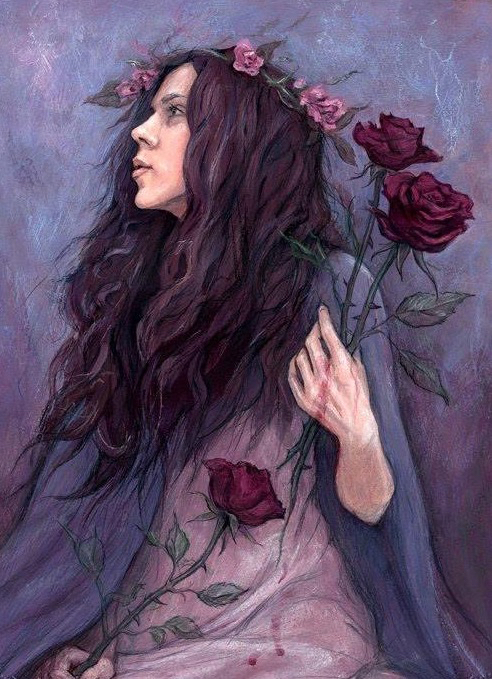 The roses are beautiful and in bloom, but the woman in the card is holding them so tightly- maybe afraid to let them go, maybe afraid of seeing them change- that the thorns have hurt her hands. So something really beautiful is actually causing her pain her because of the way she’s engaging with it. It’s that way with life, as well. And she’s not really conscious of it- she looks off into the distance, lost in whatever it is she’s looking for. Anyway… that’s how I “read” a Tarot card. Everyone has their own way. I just love to look at the images and find things that resonate with me. So, I wanted to use my Tarot decks as meditation and journaling inspiration, and I started looking for more information on that. 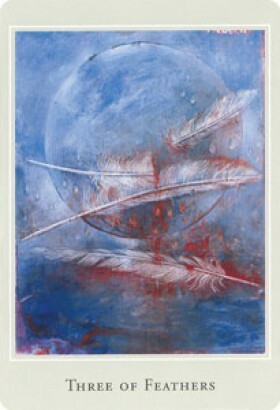 I found a great book called “Going Beyond the Little White Book: A Contemporary Guide to Tarot” by Liz Worth. It’s got a few pages of self-reflective information for each of the cards, and then ten or so questions for consideration, discussion, and/or journalling for each of the cards. I started working with that book, and I also started collecting Tarot decks in earnest. The art on some of the modern decks is *so* beautiful. And buying decks is a great way to support independent artists- we don’t have a ton of wall space in our home, and I’ve always wanted to do more as far as purchasing art direct from artists, and now I have a way to do that. I use my decks as inspiration for meditation and contemplation, as inspiration for journaling (both art journaling and written), plus they give me an excuse to dip my toes back into the world of art history, mythology, and symbolism- all the stuff I studied in college. The way I use Tarot is that every week or so, I draw a card, look at my different decks to see how other artists interpret the same card, into the historical symbolism of some of the motifs on the card, see if there’s any mythology attached and read about that, and then do a sort of stream-of-consciously journal about the different connections I find in my research and what they mean to me. I usually end up with about ten pages of “research and ideas” for each card. I never intentionally started doing it- about nine months ago, I was looking at a card and wondering about Odin and ravens and the symbolism behind that. I decided to do some research and journaling about it, and *BOOM* nine months have passed and I have several hundred pages of stuff recorded from looking at different cards and exploring the art and symbolism and narrative bits that resonate with me. It is sort of a guided journaling/meditation practice for me that I have been doing every single morning since the beginning of 2018, sort of my version of “morning pages”. I enjoy it, it’s a good way to start the day and get my brain going, and I didn’t even realize how long I had been doing it until I just looked at the calendar. It’s just really *fun* and interesting for me, to be honest. It’s like a research project for myself. I’ve learned a ton of about literature, art history, symbolism, psychology, neuroscience, mythology, independent artists, Buddhism (many decks incorporate a lot of Buddhist ideas), philosophy, astronomy (not astrology, astronomy, although there is astrology in there, too…), etc. It’s just this cool mish-mash of all these different fields that I’m interested in coming together, connected by art and creativity and narrative resonance. Anyway, I thought since I’m trying to write and publish here a little more, I’d bring in the Tarot stuff and I’d work on some journaling questions from “Going Beyond the Little White Book” by Liz Worth here in my journal for each card I pull. It might give me a little more of a feeling of accountability and bring my Tarot “research” into a sort of personal applicable approach. Since this post is getting long, I’ll do the set of questions for the card I have been working with this last week (Three of Swords) in my next post. I’m interested! I’ve been more interesting in the plant decks I see but haven’t bought them yet. I’m also curious what decks you want to give away/sell so maybe post those too in case we are interested!